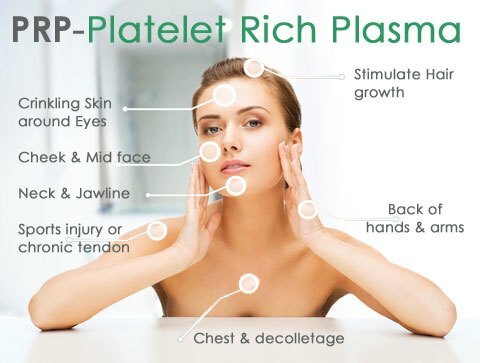 Platelet Rich Plasma (PRP) Therapy is a popular skin rejuvenating treatment sometimes known as the Vampire Facial. The colloquial name “Vampire Facial” comes from the use of the patient’s own blood in the treatment, and the prevalence of vampires in popular culture. The Vampire Facial is a non-invasive treatment made up of small injections into targeted areas of the face. The injections are very small and similar to those used in Anti-wrinkle injections and dermal filler treatment. 1) Preparation: The treatment area is thoroughly cleansed and prepared. 2) Targeting injections: Your physician marks the areas on your face that need to be freshened or lifted with a special pencil that wipes away easily. 3) Blood draw: Your physician takes about 2 teaspoons of blood from your arm, in the same way you would have a regular blood test. 4) Isolating PRP: The drawn blood is placed in a centrifuge for 5 to 10 minutes. This equipment spins the blood at high speed to separate the lighter plasma from the rest of contents of the blood. This isolated platelet rich plasma is “activated” by a special process to begin releasing growth factors that, once injected into the body, will increase collagen production and have other healing effects. 5) Topical anesthesia: If required or requested, your physician will apply a topical numbing cream to your face to keep you comfortable during your treatment. 6) Injection of PRP: The physician injects the separated and activated platelet rich plasma back into your face. 7) Repeat: Best results are obtained after about three treatments spaced about a month apart, though a single treatment can be effective for some individuals. 8) Watch and wait: Growth factors contained in the plasma stimulate the release of the skin’s stem cells. The skin is being tricked into believing that it has been injured and must heal itself with new, fresh tissue. This somewhat sneaky process allows the skin to create new collagen, new blood vessels, and new cells. The results will not be immediate, so while you patiently wait a few weeks and even a few months, your skin will begin to transform itself. An appointment for a PRP treatment will take about 30 minutes to one hour, though treatment time varies depending on the number of areas you are targeting. Who is the ideal candidate for the Vampire Facial? This procedure is not recommended for those with blood-related conditions, anemia, or blood or bone cancers. Patients who take blood thinning medication or non-steroidal anti-inflammatories (NSAIDs) should discontinue their medication for a few weeks prior to their treatment and for a few days afterwards according to physician instructions. The Vampire Facial requires little recovery time. There may be redness and some tenderness on the first day that appears much like sunburn. Occasionally some bruising may occur. The initial redness will subside on the second day, and some patients then notice some swelling and a sandpaper texture to the skin the day after treatment. By the third day, the swelling should diminish. The sandpaper texture to the skin may persist for up to a week. Though you may notice these changes, you will not likely have any significant downtime as a result of these symptoms. You can go back to your regular daily activities after your appointment and, with a light make-up application, no one will be the wiser about your procedure. Results of PRP Therapy: What can I expect? Within a few days patients begin to see noticeable results. Within 2 to 3 months, when the greatest benefit is seen, individuals report fully refreshed skin that looks and feels more youthful. These results can last between 1 to 2 years afterwards depending on the individual.